In October 2008, Discovery announced that they would launch a channel on Freeview in early 2009, but without using the "Discovery" name. A placeholder appeared on Freeview channel 47 on 5 January 2009 and Tiscali TV channel 109 on 14 May 2009. Although the channel planned to launch on 14 May 2009 at 10am, after broadcasting a promo loop on the planned launch morning, at 10am the channel returned to displaying a "Coming soon" message. The Quest website displayed a message reading: "Regrettably we have made the decision to postpone the launch of Quest. Due to a number of commercial factors we have had to make this difficult decision. We did not make this decision lightly and we are working towards launching Quest in the near future. We would like to apologise wholeheartedly to any of you that have been looking forward to this launch." In August 2009, Discovery Networks announced that it planned to launch the channel on 30 September 2009. At the same time the channel moved to channel 38. 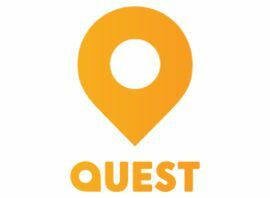 Quest launched on Sky, on 1 October 2009, after acquiring an EPG slot from Information TV 2. Quest +1 launched on Sky, replacing DMAX +1.5 on 2 November 2009. Quest launched on Virgin Media on 25 March 2010 on channel 179.